There's a never-ending stream of games coming out on the Nintendo Switch at the moment. The big ones are obvious: Fire Emblem Warriors released last week. Mario Odyssey this week. But underneath those big releases are so many games from independent developers that it's safe to say that the challenges that Nintendo faced getting games onto the Wii U are certainly not going to be repeated this time around. Of course it's difficult for any site to review all of these games, let alone a relatively small site like DDNet. So, in the interest of catching up with some of the indie releases on the Nintendo Switch over the last week or so, I thought I'd do a series of short 'n sweet reviews. 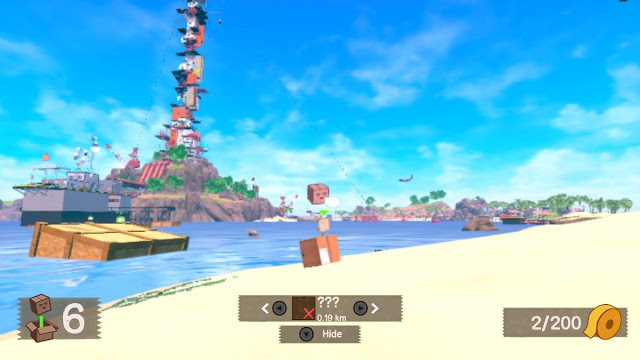 Unbox bills itself as the first 3D platformer on the Nintendo Switch. That would be about right, I guess, and that's a pity, because Nintendo and platformers go hand-in-hand, and it would have been nice for the first platformer on the Nintendo Switch to be worth playing. Unbox puts you in control of a box. Simple enough so far, right? 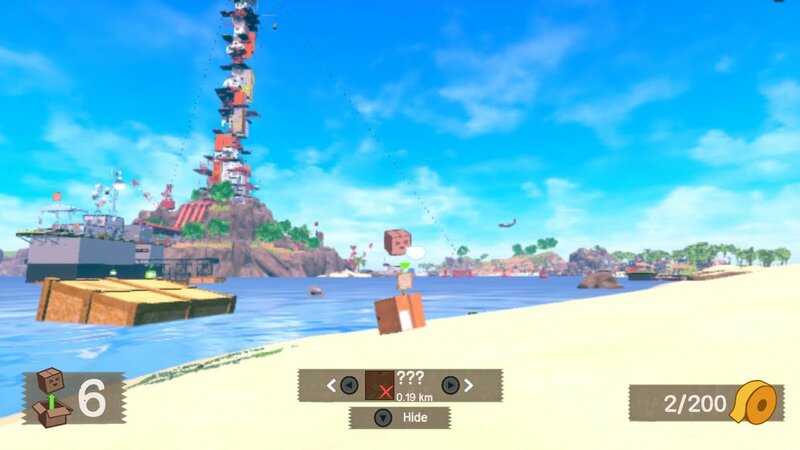 Some ham-fisted story (which tries to be funny and self aware, but largely fails), tells you that your job as a box is to move stuff around, but really that translates into "explore a large island for stamps and golden tape and other nonsense until you fall asleep." If it's not the awkward physics that get you - the box moves around more like a ball, but one with the most basic understanding of momentum and inertia that I've seen in some time - the jumping mechanics certainly will, as the big double jump ability makes it difficult to judge landing areas, and sometimes propels your box so far into the sky that the platform disappears completely. And given that water is deadly to your box fellow, there's a lot of restarts involved in this game. The graphical engine is quite poor, with texture pop-in that happens just a few virtual metres in front of the box, and aside from trying to tap into the old school 3D platformer's love of collecting hidden stuff (so you can unlock extra costumes and things for a box character that you're unlikely to care about), there just isn't that much to actually do in Unbox. As someone who would happily lounge on a tropical island every day, given half the chance, I've never seen a more unappealing "tropical paradise" as this one. There are bugs (because of course there are), and very long loading times, but on the plus side there is a multiplayer mode. On the downside I never managed to actually get someone to play this with me. They took one look at the single player game, with all its misfiring attempts at nostalgic glory, and begged me to play something else instead. And now we move to the Nintendo Switch's first attempt at a first person, 3D horror game. 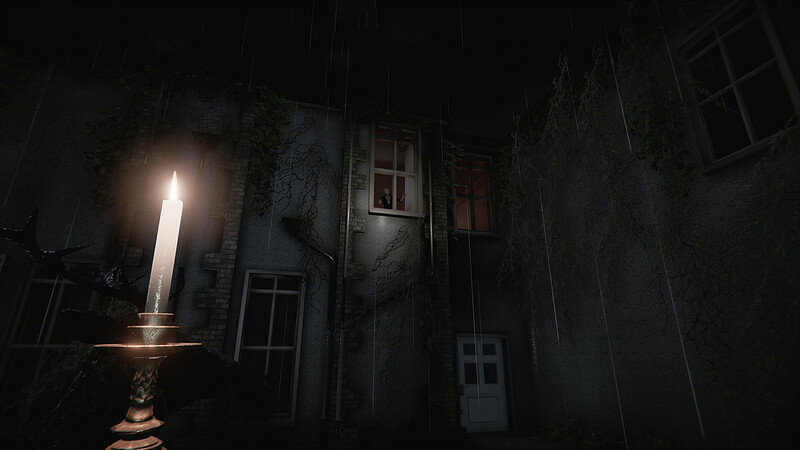 Don't Knock Twice is also available on other platforms and in VR, and I actually think it would be more passable in VR, where the focus on creating scares through ambient sound and the perception of what's around you is a more natural fit. But on the Switch it just looks like a poorly compressed, cheaply produced, weak concept Halloween cash-in. On the Switch's portable screen - where I play all my games - Don't Knock Twice is that much more difficult to play, because text on the screen is tiny, the dot in the middle of the screen that you use for aiming to pick up and interact with objects is so small it's impossible to line up, and any attempts by the game to be scary via subtle visual cues is largely pointless. There's a decent enough concept backing the game, as it's based on various urban legends, and a film that, itself, was a decent enough idea. The actual title of the game works, too, because I was immediately on edge when I heard the door knocking. If nothing else Don't Knock Twice does do a decent job in creating anticipation as the player explores areas for the first time... and just knowing that something horrible's waiting on the other side of the door. But the generally poor action, when there are moments of action, and the amateurish storytelling start to let the game down after an initially decent impression. In the end there's nothing this one actually does that we haven't seen from better horror games. Even within the "walking simulator" horror genre - or close relations to it - Layers of Fear is coming to the Nintendo Switch, and it's one that tells a much more original and intense story. I don't actively dislike Don't Knock Twice. I just find it painfully bland and generic... and really, it's harder to forgive that in the horror genre than almost any other. This is hardly a new game, but it seems to be a decent money spinner for the developer, so it continues to be released on every platform known to humankind. I wouldn't be surprised if there was a Kindle version at this point. As a top down shooter that bills itself as a "roguelike", Neon Chrome is decent enough. The "roguelike" claim comes from the endless grind of increasingly more difficult randomly-generated levels that you'll need to push through. 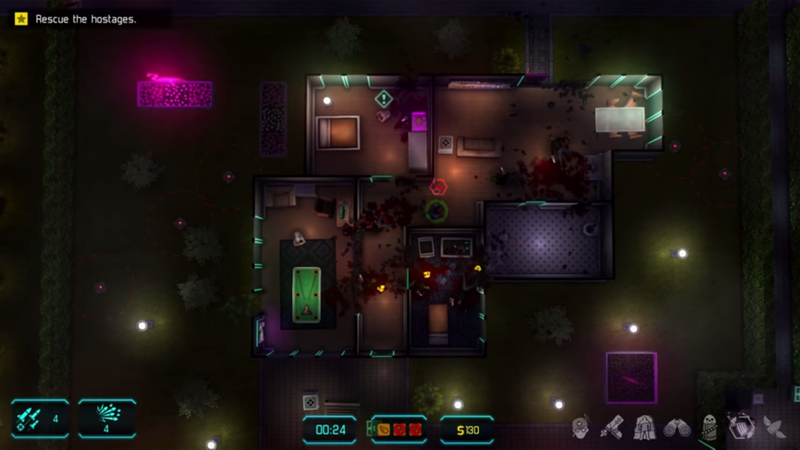 Those all play out just like a dual-stick shooter, and you'll need to make your way past all kinds of enemies and traps. Eventually something's probably going to get you killed, at which point you'll be returned to level 1 with a new character, but also the ability to use the loot you earned from the first run to upgrade equipment and the like. This way you'll slowly accumulate the power you need to make it further through the game... and perhaps even finish it in the end. Neon Chrome can get both difficult and rewarding. It's just as well that core gameplay loop is satisfying, because its efforts to tell some kind of story - a cyberpunk tale of corporations gone too far - is most certainly not something you'll continue the grind for. It's not an original game by any means, though it also doesn't do anything wrong. I'd be surprised if this game was still finding new fans at this stage, but it's not a bad one to have on the Nintendo Switch for playing on the go either. 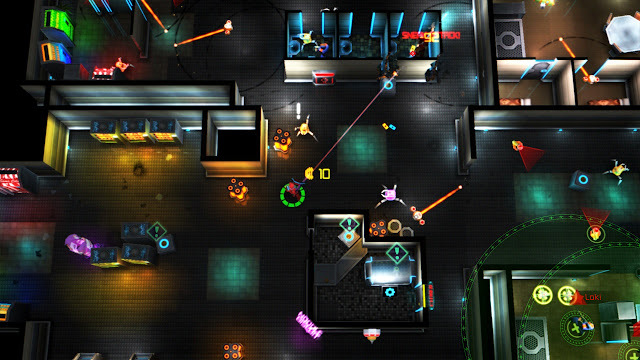 Jydge is what happens when Neon Chrome became popular enough that the developer decided to spin it into a franchise. Set in the same world, and using the same top-down mechanics, this unashamed clone of Judge Dredd actually manages to elevate the action by giving it some context. You play as Judge Dredd - sorry, a Jydge - who needs to bust into places that have come under attack from criminals and dispense hard justice. Along the way he needs to make sure that the civilians being menaced don't accidentally get shot - the game's quite unforgiving about civilian death at the hands of law enforcement (not particularly realistic there, I guess). Levels are better designed here than in Neon Chrome, in part because they're actually designed rather than randomised, and it's a lot of fun to scout out an area before designing a path of attack. I would have much (much) preferred having more tools at my disposal to break into these buildings and deal with the criminals, but then we are playing an action game, rather than James Bond: The Top Down Game. At least you can customise your Jydge quite a lot to suit your play style. 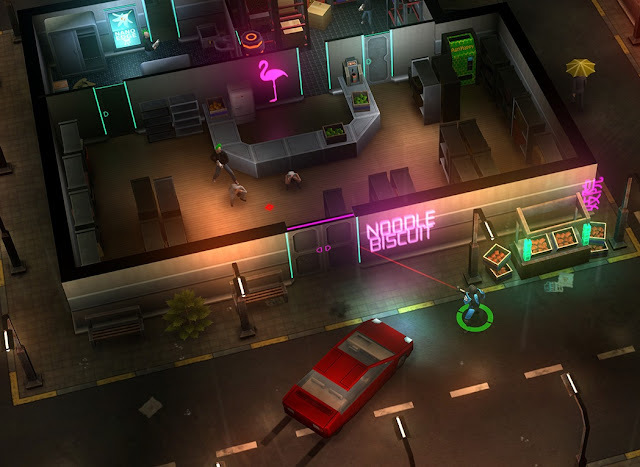 There's quite a few levels to work through in Jydge, so you'll get your money's worth. There's probably no reason to go for both this and Neon Chrome, though. There's just not enough variety in how the games play (or indeed their visual design) to sustain them across two titles. I like the idea of spinning this setting into a franchise, as there's potential there, but giving another genre a crack would be a good idea at this point.